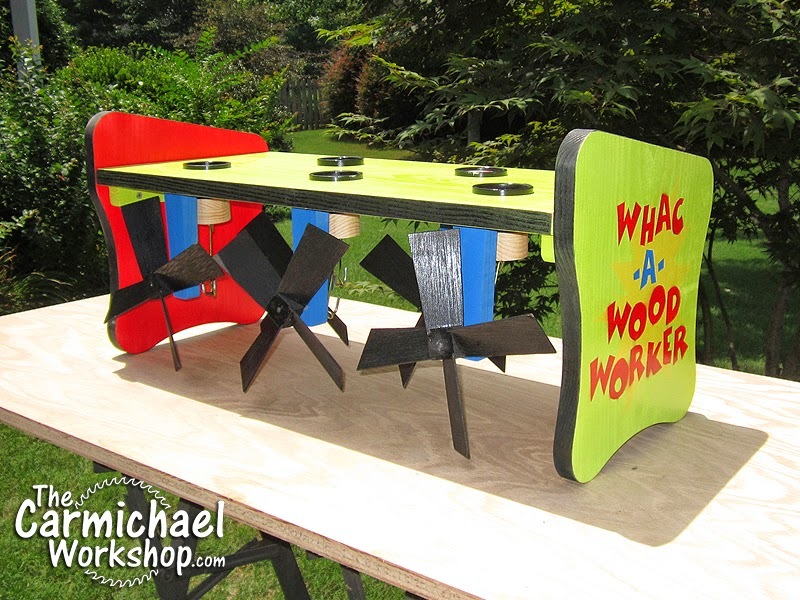 The Carmichael Workshop: Whac-A-Woodworker Whirligig Wars 2014 Contest Entry! 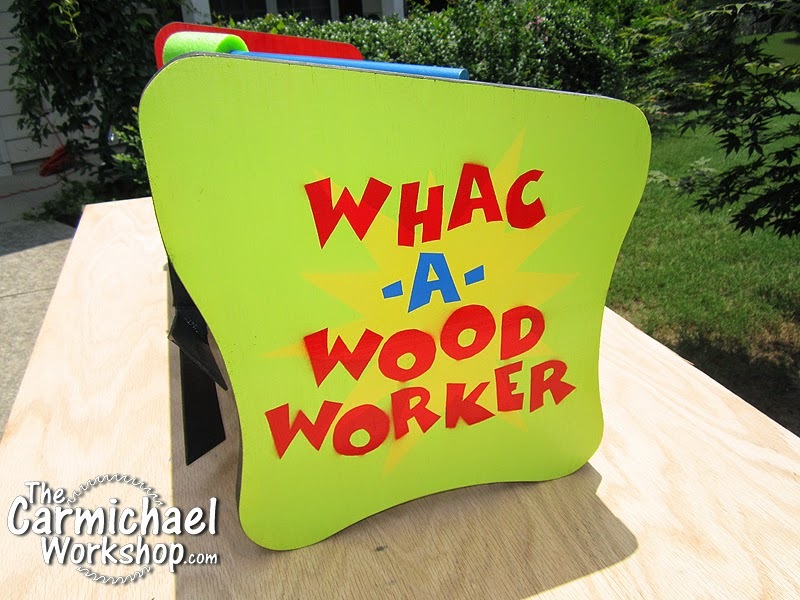 Whac-A-Woodworker Whirligig Wars 2014 Contest Entry! 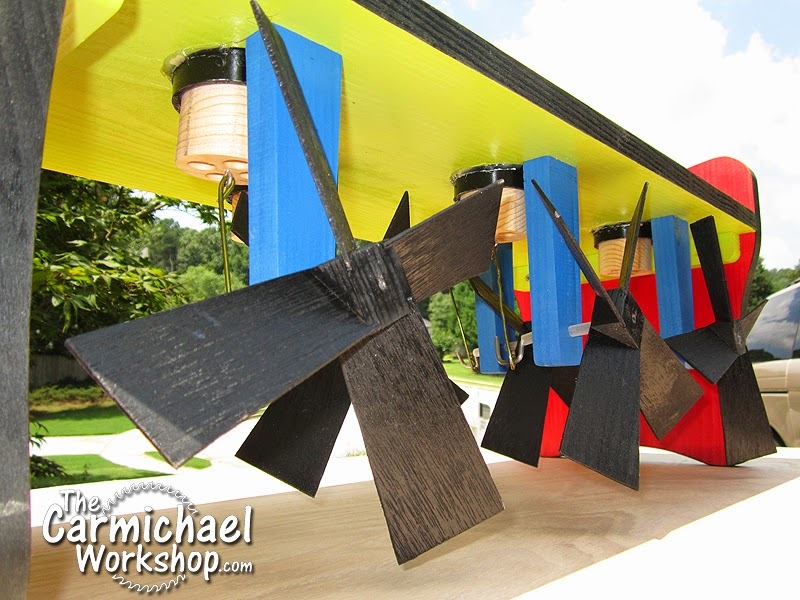 This is my entry for the 2014 Whirligig Wars contest hosted by Laney Shaughnessy and Steve Ramsey. 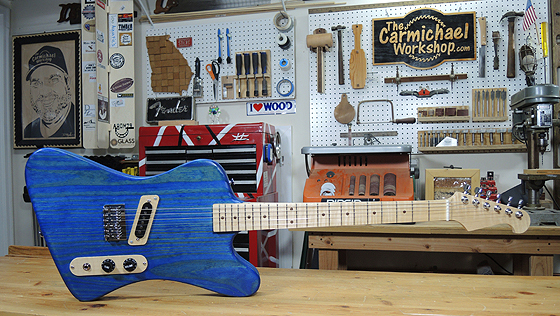 Every entry in this year's contest helps to support the Make-A-Wish Foundation. Please consider submitting a whirligig for the contest so you can help too! This contest is not about winning a prize - It's about making a difference and helping to make kids' wishes come true. Let's do what we can to help. Thanks to Steve and Laney for hosting the contest and supporting Make-A-Wish. Also thanks to the sponsors who have donated prizes to encourage everyone to participate in this awesome event. I wish everyone who enters good luck and remember that the kids already win when you enter a whirligig into the contest! Here is the picture of the finished project. My favorite part of this project is the cool colors. I really recommend the new Rustoleum 2X paints. They spray on really nicely with great coverage. The green is called Key Lime. The five propellers blow independently in the wind making the game play random. They are small at 8" wide in order to keep the whirligig small, but they do well at pushing up the players with a nice wind. I attached the blue prop supports underneath with pocket holes so that there would be no screws showing on the top side. I used 3/16" steel rod for the propeller axles and coat hanger wire as a connector. The woodworkers remind me of pistons in an engine. 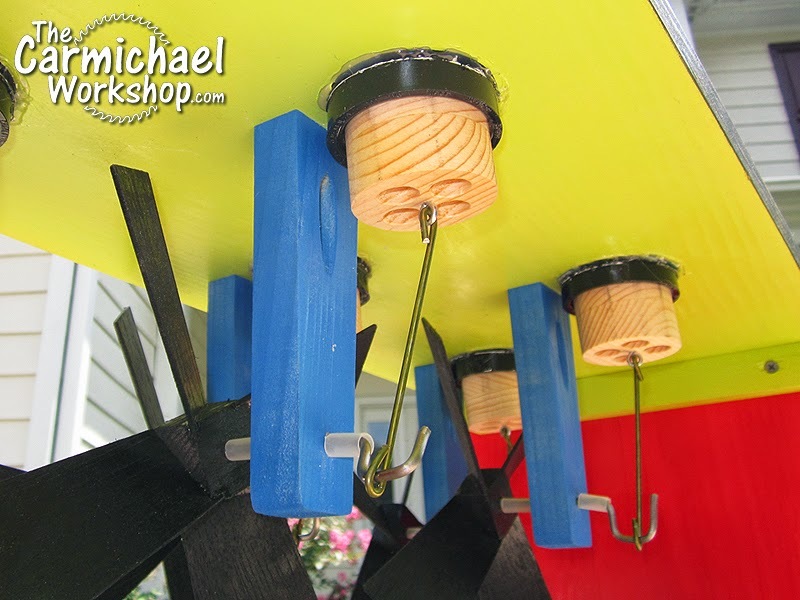 I glued together three 3/4" pine boards and cut the circles out, then drilled holes to make them lighter. The black pipes are PVC couplings painted black. To make the logo on the sides, I painted the board green and cut a paper stencil and sprayed the yellow starburst. Then I cut two more paper stencils to paint the red and blue lettering. I let the paint dry for about 30 minutes and when it was still a little tacky, I was able to stick my next stencil to it without ruining the paint...it would hold the stencil down for the next color. I painted the other side red for more color and painted the edges black like the Whac-A-Mole game. 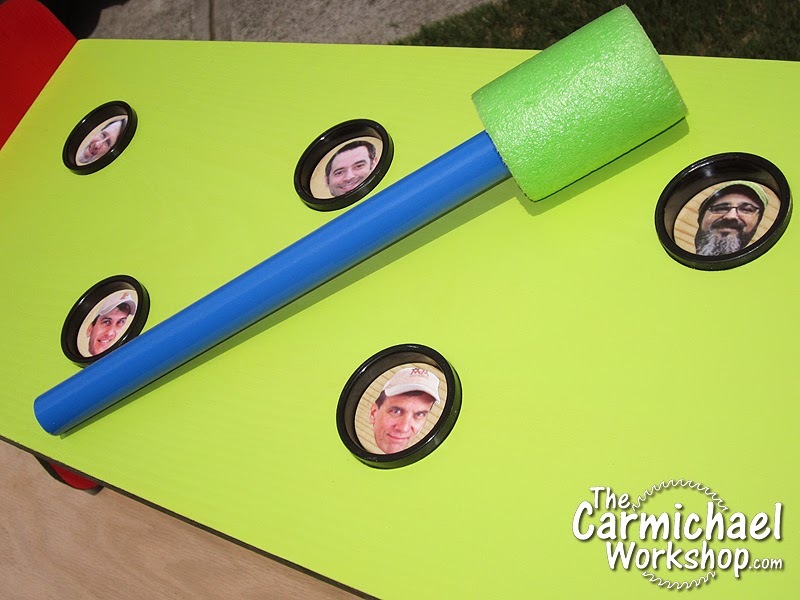 I made the mallet using a dowel and a small section of a pool noodle. (Shh, don't tell my daughter her pool noodle is a few inches shorter now.) Selecting the five woodworkers was easy. I have learned so much from Laney, Steve, Matt, Marc, and Norm about woodworking and making videos. 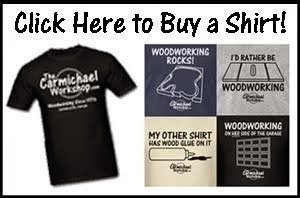 I grew up watching Norm, and the others were the first woodworkers I found when I started looking for woodworking inspiration a few years ago. This was a very fun project for me. When I inherited my father's tools, it became my mission to find ways to help out others using his tools. If I can make something like this and enter a contest to help make a wish come true for a child, then I'm happy to do it. Please visit Make-A-Wish to find out how you can help too!